There are lots of great museums in the world, and if there were a museum Olympics every four years, it would be extremely competitive. The games would be dominated by powerhouses like the Victoria and Albert, The Metropolitan Museum, and the Smithsonian. In furniture and Americana, you’d have specialized contenders like Winterthur. And, of course, in railroads, the California State Railroad Museum. But here’s another way of looking at this: what if you were stranded on a desert island for a year, and could only take five museums with you? 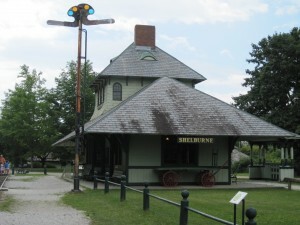 For me, The Shelburne Museum in Burlington, Vermont, would be tops on that list. This northern New England gem should be on every collectors must-see list. I have family in Burlington and so have visited Shelburne several times, most recently last week. I’ve seen world-class exhibits on subjects ranging from Shaker furniture to carousel animals to North American taxidermy. I’ve wandered the grounds (hundreds of acres) in wonder at the determination of collector and museum founder Electra Havemeyer Webb (1888-1960), who relocated 20 historic structures to Shelburne to house its collection. These include include barns, a meeting house, a one-room schoolhouse, a lighthouse, a jail, a general store, a covered bridge, and the 220-foot steamboat Ticonderoga. According to the Museum’s website, Mrs. Webb sought to create “an educational project, varied and alive.” And she succeeded. 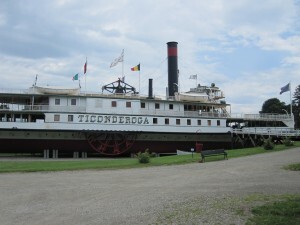 It’s the perfect mix of a beautiful New England setting, hands-on kids activities, an endless variety of exhibits in 38 buildings total, and some things you just look at and say “whoever had the imagination to do that was an incredible collector” (like dragging a paddlewheel steamer two miles inland in 1955). During our short two-hour visit, we also made a quick stop at the Beach Lodge, which is full of stuffed grizzly bears, moose, elk, and other ferocious looking animals that looked worthy of Teddy Roosevelt. We also ducked in to the kids crafts house and the museum’s cafe for some burgers and fries. Didn’t have time to see the dolls, the wildfowl decoy exhibit, the “hat and fragrance textile gallery,” the automata, the horse-drawn carriages, the tools, the Hudson River School landscapes… wow – I still haven’t seen half of this great place! I’ll be back to The Shelburne Museum for sure. You should check it out, too. Do you have a favorite museum? Post photos of your favorite museum exhibits on our Show & Tell pages, or let us know in the comments below. What a fascinating museum!! I spend one day there and was a lifetime experience for me. One could spend many hours here. There are many buildings of different periods of time which are worth to see. They have preserve the memories of founder of the museum. I had a great time at Shelburn Museum. 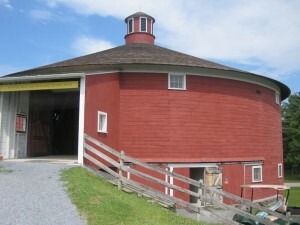 http://www.historicalplacesinamerica.com/shelburne-museum is good resource on the web which gave me a great information about this museum. Out of all museums I have visited Shelburne is the most beautiful and indescribable museum. There are many buildings of different period of time which are well maintained. There is something for everyone from a lighthouse, a paddle wheeler, locomotive, jail, a merry go round. This is must visit place for history buffs and to learn about local history. “ ” To long-time Dr. Seuss fans, his ads might seem like a sell-out.